Second Chance: Furmankind II, by Ted R. Blasingame – Book Review by Fred Patten. Raleigh, NC, Lulu.com, May 2015, trade paperback $21.99 (460 pages). This says “Revised and expanded edition”, but if I am reading Blasingame’s production schedule correctly, this was written between June 2012 and June 2014, allowed to sit for almost a year, and then revised and published in May 2015. So this Lulu.com trade paperback may be revised and expanded, but it is the first paper/printed edition. 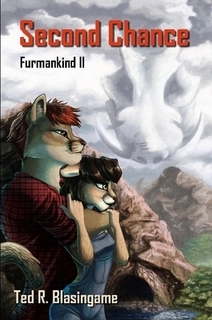 Second Chance: Furmankind II is not as much a sequel to Sunset of Furmankind as it is a continuation of the same story. The former novel concentrated on the humans in Brian Barrett’s/Jon Sunset’s group of volunteers being bioengineered into Furs – supposedly hardier than unmodified humans; a hybrid of human and animal: four each of large feline, large canid, bear, and fox – and sent with a similar group (but two are anthro red pandas) to the extrasolar planet Bonestell to establish an Earth colony there. Bonestell appears to be practically a paradise compared to other newly-discovered worlds; very much like pre-human North America – but the first human colony spaceship sent there completely disappeared for unknown reasons. This second group considers itself humanity’s Second Chance at colonizing Bonestell, and adopts that name. Second Chance: Furmankind II is the story of the 32 male and female Furs’ (actually 31 due to a death in Sunset of Furmankind) first year on Bonestell; or 2½ Earth years due to Bonestell’s longer rotation. It’s very much like a novel about a group of pioneers of the early 19th century pushing into the Ohio or Mississippi river valleys to establish homes, farms, and a town; with the differences that nobody knows which of the new animals, insects, and plants are safe or poisonous, whether the planet has any dangerous natives, or what made the first colonizers disappear. The Second Chance group find out by trial and error. There are successes and failures; natural and violent deaths; matings and children. Jon Sunset (cougar; no longer Brian Barrett) is still a leading character, but Second Chance focuses equally on several others among the 31 pioneers: Kristen Eisenberg (cougar), Cheryl Dalton (Border collie), Carl Amaranth (grey wolf), Gerard Nicholas (brown bear), Masanori and Chieko Mochizuki (the red pandas), Kevin Rockwell (fennec), Dara Turner (polar bear), Jenni Watson (leopard), and more. They are bioengineered humans, not anthropomorphic animals, so while they take deliberate advantage of their new animal natures, they remain mentally human. Those animal natures – stronger hearing and scent; long fur (especially when they develop winter coats) for warmth, and the lack of prominent breasts on nonhuman female mammals, make clothing above the waist optional except for pockets; dropping to all fours makes running long distances more practical; they wonder what the children within a species (say, of a humanoid lion and lynx, or wolf and golden setter) will look like. There is plenty here for furry fans. Second Chance is a novel in which Ted Blasingame’s wordiness works to real advantage. An editor at a commercial publisher would probably advise him to make it more succinct; cut out the chapters without real drama and concentrate on the exciting scenes. Instead, the reader gets the whole story of the Furs’ first year on Bonestell: the peaceful explorations of new valleys, the dubious discoveries of new animals and hesitant tasting of new plants, the gradual replacement of 22nd-century Earth technology with local improvisations, the human-interest interactions of the 31 Furs; with the moments of drama and death mixed among these. Second Chance (cover by Elizabeth Jackson) starts slowly with the whole world of Bonestell a mystery to the Furs. By the time they’ve been there a year, it’s still different but no longer mysterious. They know what can be domesticated and what to avoid. It’s home. The surviving Furs and their children are ready to welcome the next colonists from Earth. Second Chance is definitely recommended. It stands alone, although if you haven’t read Sunset of Furmankind first, you should start there. Is this book avalible in the kindle store by any chance?